One Japanese word for "stitch" is kagari; an alternate word is gake. Differences arise from the various dialects and areas of Japan where the terminology originates, but these are the two words used for "stitch", with kagari being the more common. Most Japanese stitch names will have kagari or gake as the last part of it (usually kagari); just know that gake means the same thing. Kagari literally translates as "tiny stitch" - the word "tiny" being key - as in small dress-making stitches. 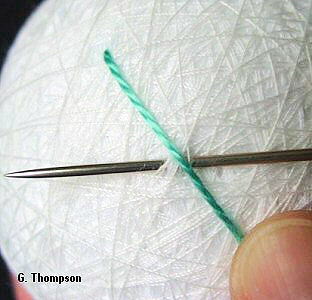 The action of bringing the thread up from the mari after anchoring it (see Basics: Little Things), placing the thread where you want it to be, entering the needle into the mari base, and pulling it and the working thread through to secure the thread in that place, is taking a stitch - or, creating kagari. One needs to focus on the size of the stitch in that it is tiny, about 2mm or so, in order to obtain a clean crisp outcome with clear resolution in temari designs. There are a few exceptions to the size of the stitch within some specific temari stitches, but unless otherwise specified, a "regular" stitch in temari making is this small bite of the mari base. The thread is pulled thorough the thread wraps, so that the visible thread on the surface of the mari falls into place with moderate tension. It should stay in place against mild friction, but not be so tight so as to pull the marking threads out of alignment, strain the entry and exit points of the thread, or dent/alter the shape of the mari. Conversely, there should not be any floppiness or looseness visible, or space seen between the thread and the mari due to too loose tension.